The Texas Instruments Foundation recently announced a $500,000 capital grant that will be used to develop the Texas Instruments Innovation Center, a building within the $14M, 92-acre STEM Center of Excellence in southwest Dallas. As young as age six, girls begin to identify boys as more brilliant. They also start associating men with the term “leader,” and begin backing away from more complex subjects such as math and science. Earlier this year, Florida State University released a research study which argued that girls’ confidence, not their academic abilities, kept them from pursuing hard math and science. The confidence gap between girls and boys widens more extensively at the middle school years, a critical juncture for identity formation. When gender norms are developed at such an early age, the risk is that girls begin to think they can’t be scientists or mathematicians, and a clearer picture emerges of why women are under-represented in STEM jobs — science, technology, engineering and mathematics. but women only represent 25.2% in computer & mathematical roles and 14% in architecture & engineering roles. The statistics behind this picture are sobering. According to a report issued by the United States Department of Labor, 44.3 percent of full-time wage and salary workers in 2016 were women. Yet among full-time STEM occupations, women accounted for smaller shares of employment: 25.2 percent in computer and mathematical roles, and 14.0 percent in architecture and engineering roles. Since 2015, the Census Bureau and Bureau of Labor Statistics have reported that women are now steadily surpassing men in educational attainment. It’s vexing, then, that while there are more educated women in the workforce, the percentage of women in STEM jobs remains low. This is especially frustrating when you think about the requirements of the future workforce and the issues facing girls and women today. The vast majority of jobs in the next 10 years will require STEM aptitude — even those outside of STEM industries. However, if girls do not have the confidence in their abilities, a strong sense of self, and the ability to think critically, problem solve, manage conflict, or advocate for themselves, their likelihood of entering and remaining in the STEM pipeline greatly reduces. Google — one of the great innovative tech giants — recently released findings about attaining tech talent. As reported in the Washington Post, Google asserts that technical training must be compounded with soft skills such as empathy, confidence, ability to work on a team, generosity, and curiosity. So, what’s the key to closing the gender gap in the STEM pipeline? It appears the answer lies somewhere between the right combination of introducing girls to math and science at an early age, and in developing their self-confidence. In 2010, Texas Instruments (TI) approached the Girl Scouts of Northeast Texas with a problem. The talent pipeline was not growing at a rate to meet industry demand, and by 2020 there would not be enough engineers to hire in North Texas. Because Girl Scouts of Northeast Texas serves more than 25,000 girls and has direct access to supporting the development of girls outside of the classroom, TI challenged them to think differently. TI was interested in a comprehensive approach to encourage girls to pursue careers within STEM fields and connect them with strong female role models in order to grow the women-in-STEM pipeline. How could nonprofit organizations, primary and secondary educators, and collegiate institutions make a collective impact to support girls at a young age that would build their confidence in hard STEM skills while nurturing their soft skills? TI’s initial investment in Girl Scouts included working collaboratively with TI engineers to design a K-12 engineering patch program to introduce girls to this type of career. While the Girl Scouts were no strangers to STEM, the launch of an engineering patch program marked a concerted effort to provide a progressive experience that would drive girls from early education into STEM careers. What started with a patch has now grown into the construction of a 92-acre STEM Center of Excellence in southwest Dallas. The proximity of the urban camp within the Dallas metroplex, just a one-hour drive for approximately 18,000 girls currently served by Girl Scouts of Northeast Texas, and within a very short drive from more than 40,000 under-served girls, affords a greater number of girls the ability to explore science, technology, engineering and math in a unique all-girl environment where they feel comfortable trying new things, taking appropriate risks, and learning from failure. To date, Girl Scouts of Northeast Texas has raised nearly $14 million for the STEM Center. Additionally, the TI Foundation added its support to the STEM efforts of the Girls Scouts of Northeast Texas and recently announced a $500,000 capital grant that will be used to develop the Texas Instruments Innovation Center—a building within the STEM Center where Girl Scouts can gather in small groups and use their creativity to launch the design process in an inspiring environment. The building will also serve as the home of Girl Scout robotics teams and small groups who need a safe space for ongoing projects. “For TI in particular, we know that STEM education is critical to our company’s future, to our industry, and to the communities in which we operate worldwide,” said Peter Balyta, vice president of academic engagement and corporate citizenship for Texas Instruments, and president of its Education Technology business. Through a combination of tech-focused facilities, an outdoor setting, girl-focused programming, and the introduction of 23 new STEM and outdoor badges, Girl Scouts is both enhancing the important outdoor opportunities the organization is known for and addressing the lack of opportunities many girls have as young as age five. In fact, Girl Scouts are almost twice as likely as non–Girl Scouts to participate in STEM (60 percent versus 35 percent) and outdoor activities (76 percent versus 43 percent). Through the hands-on girl-centric programming offered at The STEM Center, girls can create algorithms, design robots and racecars, go on environmentally conscious camping trips, real-world collect data in the great outdoors, try their hand at engineering, and so much more. The programs offered at the facility follow specific guidelines proven by the Girl Scout Research Institute to improve girls’ confidence and engagement in STEM. Girl Scouts receive support from STEM professionals and are instructed by caring adults who make them feel valued. Volunteers who provide technical support as well as career mentoring are crucial to the learning experience — helping girls understand career options and see who they can become. They are also given the chance to learn by doing — hands-on programs encourage girls to take risks, work as a team, build with their hands, and take the lead. The Girl Scouts program model has proven effective with girls developing a strong STEM identity and having a more equitable perception of the relative abilities of women and men in STEM industries. 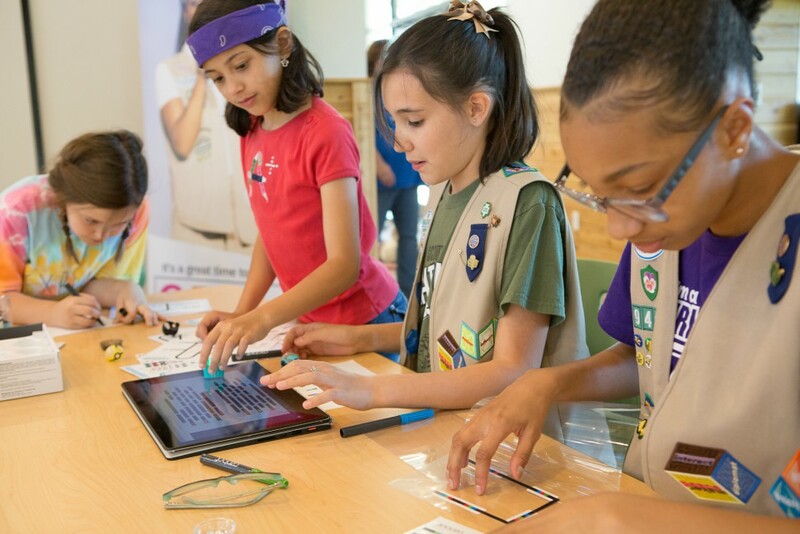 Today, 77% of girls report that because of Girl Scouts, they are more interested in a career in technology. “TI believes that strong companies build strong communities and strong communities build strong companies,” said Balyta. The STEM Center will celebrate its grand opening with a community celebration May 5-6, 2018. The community is invited to celebrate through hands-on experiences including robotics, coding, drone demonstrations, STEM and nature walks, health sciences demos, and more. Registration is now open at stemcenter.gsnetx.org. To get involved with Girl Scouts of Northeast Texas as a summer program volunteer please contact [email protected].